That's just to give you an idea. Note that the AVR can only convert at 80kSPS at reduced resolution. Also, the ARM has a built-in boot loader. No need for scary JTAG programming. The LPC2102 falls between the '1 and '3 in flash/sram size. Starting with nothing but a little 48-pin LQFP processor is a bit daunting. Don't panic. Building a circuit with all the necessary power and support components is actually pretty easy and not really different from other processors like the AVR ATmega series or the Parallax Propeller. The only thing really different versus a Propeller or AVR ATmega is that the LPC2101 needs an extra regulator for the 1.8V supply. Well, that's easy enough. Here's the schematic. ARM LPC2101/2/3 schematic, click to enlarge. The only thing you need to add to the schematic is a 5- or 6-pin TTL-serial header with RTS, DTR, ground and (optionally) power. Or you can use a Sparkfun FTDI breakout and manually select program mode for uploading your code. More on that shortly. 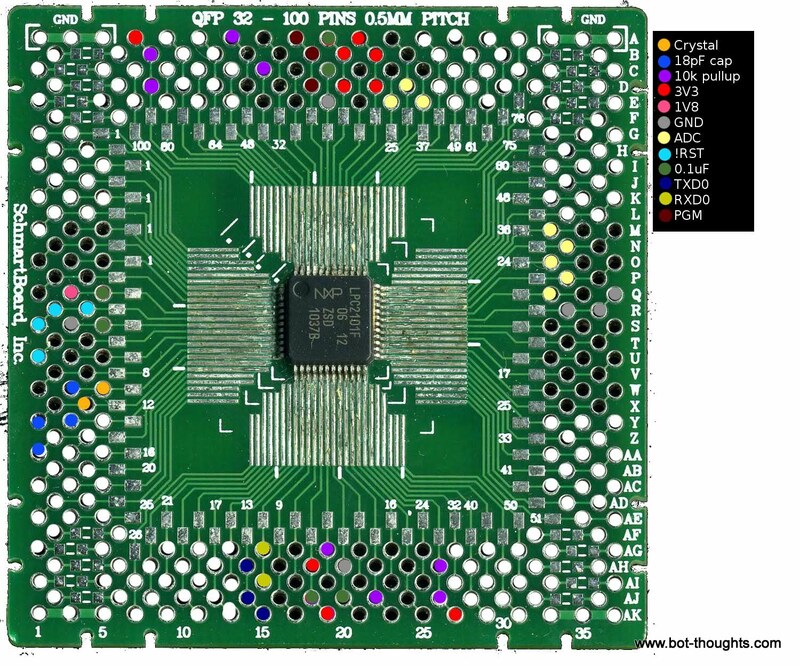 Soldering surface mount, particularly QFP chips can be very tedious and irritating. You have to delicately line up the chip and hope you don't bump it when you try to tack down the first pin. And I've only messed with larger pitch QFPs, not a 0.5mm pitch like this LPC2101. Enter Schmartboard products. Some time ago I received some Schmartboard products to review. The Schmartboard concept is to simplify surface mount hand-soldering so that anyone can easily do it. The boards use a custom fabrication process, "EZ" technology, that creates grooves for chip leads to sit in. The pads are sunken, in other words, below the solder mask, and are pre-tinned. All you have to do is stick the chip in the grooved pads, and then, pin by pin, 'push' solder towards the pin. It works. Here's how to implement the circuit above on a Schmartboard for QFP. I've color-coded the Schmartboard holes with a key in the upper right.Use the unused holes in the corners as needed to propagate Vcc, Gnd, etc. All you need for in circuit programming are 5-7 lines. You can use a 6-pin Sparkfun FTDI breakout board as I did. Either use the LPC2000 Flash Utility V2.2.3 (download) or, better yet, Flash Magic to download the code. The next article will cover using the Flash Utility to upload a hex program, as well as covering a development environment for writing my first hello world program in C.
In a later article I'll review the second ARM Newark sent, a nice little Texas Instruments Stellaris 1000-family processor.